I suspect, with the heightened awareness of young people in the aftermath of the Parkland, Florida, school shooting in February, we will see an increase in the 18-24 age group this November. While this one isn’t surprising, it is disturbing, for the very people who most need fairness from our government are the least likely to vote to make a difference. Taken together, when we look at the demographics, look at who is and who isn’t voting, is it any wonder that we currently have a government that is “Of the wealthy white people, By the wealthy white people, and For the wealthy white people”? They are the ones who vote! All of the above statistics are understandable when put into context. There are a number of things that have led to the disenfranchisement of lower income and minority voters. Consider gerrymandering, redistricting states so that most minorities are grouped into as few as districts as possible so as to be given a much weaker voice than their white counterparts. 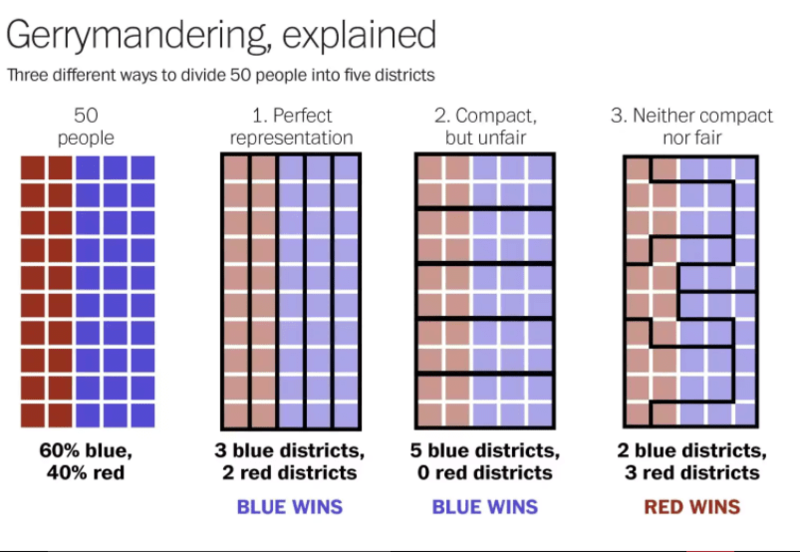 I have shared this graphic before, but it is still the clearest, most understandable explanation of how gerrymandering can change the outcome of an election: And then there are the various efforts by many states to make it more difficult for lower income and minorities to vote, such as shortening the hours that polls are open, and closing polling places in poorer or predominantly minority areas. Twenty states do not allow a person convicted of a felony to vote while serving a sentence or while on probation. Two states, Florida and Virginia, permanently disallow convicted felons voting privileges. In 1965, Congress passed, and President Lyndon Johnson signed into law, the Voting Rights Act of 1965, perhaps the single most important piece of legislation to come from the Civil Rights movement. It eliminated certain barriers to voting, such as literacy testing and other requirements that denied many blacks the right to vote. Section 5 of the Voting Rights Act precluded certain states and districts that had a history of disenfranchising blacks, from implementing any change affecting voting without receiving preapproval from the U.S. Attorney General or the U.S. District Court for D.C. But in 2013, the U.S. Supreme Court struck down Section 5 by a 5-to-4 vote, freeing nine states, mostly in the South, to change their election laws without advance federal approval. Chief Justice John Roberts said, essentially, that times had changed and the Court believed racial discrimination was no longer the problem it was in the 1960s. Almost immediately on the heels of this ruling, Texas announced new voter identification laws and redistricting maps. Other states in the South followed suit. Referring back to Part I of this project, we looked at some of the reasons people gave for not voting. When we look at the 6% who said they did not vote due to ‘registration problems’, or the 2.7% who claimed ‘inconvenient polling place’, or the 2.6% who said they had ‘transportation problems’, perhaps we can understand those reasons. Consider the single mom who is not allowed to take time off work, so she goes to vote after work. The polling station in her neighborhood closed last year, so she now has to take a bus to her new polling place 45 minutes away from where she works. Meanwhile, her children are home alone with nobody to cook their supper, or supervise them. What would you do? This is Part II of a 3-part project on Voters not Voting. Part III will look at some things that can be done to help solve the problem and get people to the polls on November 6th. This entry was tagged 2016 elections, discriminatory laws, disenfranchisement, gerrymandering, voter I.D. laws, voting demographics, Voting Rights Act of 1965. Bookmark the permalink. This would have pitchforks and burning brands out in the UK, and I would be with them. There cannot be democracy with such nit-picking restrictions. It’s painfully obvious what the intention is. True democracy Jill is an on going battle. 1) There are those who hate it because it takes away their power. 2) Those who think a ‘strong leadership’ solves everything. 3) Those who ‘know’ theirs is the true way and everyone else in not democratic. 4) Those who are just plain lazy. Each is a foe to full representation of a people. Right there next to the mean-spirited, narrow-minded crew. This is ridiculous! No wonder politicians are pulling a fast one us. I will admit though, I am beyond frustrated with some of the people in my generation. They complain and don’t vote. Some good that does. (I’m 21, btw). Don’t mean to generalize, but that’s my experience with many of my friends. Well, it IS frustrating, but you obviously have your head on straight … perhaps you can gently & subtly convince your friends? We have to try … if we keep letting the wealthy, white people be the majority of voters, we will never see equality for all in this country. The thing I’m finding is that people just want to complain while also “not caring.” I don’t know how to force people to care. That, my friend, is a part of human nature. Some people will always be content to sit back and let others do the ‘heavy lifting’ for them while they whine and complain. Others will always be the first ones to roll up their sleeves and ask what needs to be done first. Just the way of the world. The key right now is to make it personal for those who seem to not care, to make them understand how it affects them personally, for then and only then will they be motivated to act. A lot of voters are disenfranchised because of one reason or another. It’s a tragedy but its a reality. I am hoping the Parkland folks will get a ton of new voters on the rolls who will go out and actually vote this November. I think they definitely have the momentum to make a difference among the young people! And I am encouraged by that, but we still have the middle-aged people who are simply sick of it all. How do we motivate them? Thank you, Keith!!! You’re right … ‘voter fraud’ is not the problem and that has been proven more than once, yet King Donnie and his royal sycophants continue to scream it loudly for all to hear. I’m proud of you for calling it like it is … a 21st century version of Jim Crow. Given half a chance, I think a lot of states would like to return to the days of literacy tests. Thanks again for your kind words. But Jill… you are a gift to us! Excellent post, looking forward to Part III! I have a listing of homeowners and rental units in the town in which I live..and together with other “ladies” from the Resist Movement in OK, go door to door and hand out voter registration papers..we will offer to assist in filling them out, and we then offer a ride to the polling places on voting days. You’d be amazed how many do not vote because they thought they “weren’t allowed to vote” after having misdemeanor convictions! Of course, those that said that to us were people of color. I can not begin to express how angry that makes me. You are AWESOME!!!! Keep up the good work, my friend … you’re making a big difference!! !